Sponsor a WDCV show today! Underwriting is a non-commercial radio station’s answer to commercials. While different in some areas from commercial advertising, underwriting continues to be a cost effective and community minded way to get your message out to the public. We are currently welcoming local sponsors to develop closer relationships with our community, and to promote the businesses of this beloved town. However, an underwriting spot cannot include pricing information or what is often referred to as a “Call to Action” statement. Rodini’s Roadside Market, offering fresh fruits and vegetables since 1985. Open seven days a week. Rodini’s Roadside Market, 775-0100. Your message can sponsor an hour live show each week, or an hour during our automated playlist featuring a variety of music genres. Your underwriting message would air twice weekly during your preferred hour. 3 Months $80.00 special deal! 6 Months $175.00 special deal! 12 Months $350.00 special deal! Please contact WDCV at wdcvfm@gmail.com if you are interested in our sponsorship program! Whistlestop Bookshop sponsors Tall & Small, broadcasting Thursday at 7pm with DJs Julia Ormond and Rachel Gross. 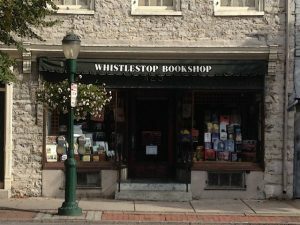 Whistlestop is a locally-owned bookstore in Carlisle’s historic downtown. They sell books, cards, games, out-of-print T-shirts and totes, and other book-related accouterment. They are open Monday through Wednesday 10am-6pm, Thursday and Friday 10am-8pm, Saturday 10am-6pm, and closed Sunday. The Twirly Top sponsors Bluegrass @ Dickinson, broadcasting Monday, Wednesday, Friday, and Saturday from 8am to 10am with DJ Davis Tracy. 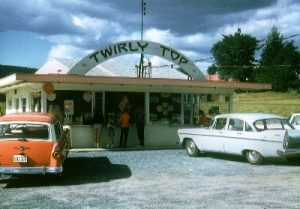 The Twirly Top is a locally-owned and operated 1950’s era drive-in restaurant and has been in operation since opening around 1952. The Twirly Top is seasonally operated, and closed Sundays. Warm Springs Lodge sponsors Bluegrass @ Dickinson, broadcasting Monday, Wednesday, Friday, and Saturday from 8am to 10am with DJ Davis Tracy. Warm Springs Lodge offers a serene creekside venue for wedding ceremonies and receptions or any other special event. Their setting overlooks beautiful Sycamore lined lawns and shimmering Sherman’s Creek. Check their website for booking events! Costopoulos Chiropractic sponsors Bluegrass @ Dickinson, broadcasting Monday, Wednesday, Friday, and Saturday from 8am to 10am with DJ Davis Tracy. 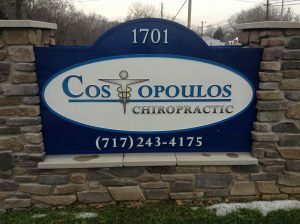 Costopoulos Chiropractic offers the Cumberland Valley chiropractic services. Open Monday through Saturday 9am-7pm, closed Sunday. Find out how to book an appointment here.